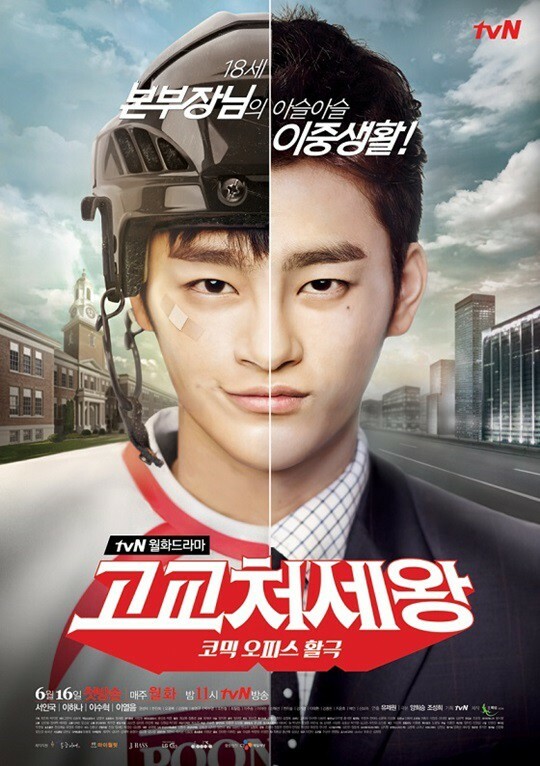 Lee Min-Seok (Seo In-Guk) is a high school student who plays ice hockey for his school. One day, he suddenly begins works as a company director instead of his older brother. At work, he meets Jung Soo-Young (Lee Ha-Na) who is a temporary employee there. "King of High School Life Conduct" takes over the tvN Mondays & Tuesdays 23:00 time slot previously occupied by "A Witch's Love” and followed by "My Secret Hotel" August 18, 2014.
lovely Apr 12 2019 7:28 pm It is was one of my favorite kdrama ever.love them both the two lead stars is quite amazing they had a great chemistry together.hope they will cast again to another kdrama together.Seo In Guk and Lee Ha -Na is really entertaining when they act.please do again another kdrama together???? Gabee Oct 12 2018 12:10 pm Waste of time. I really dislike this drama. I mean if your into an adult dating a high schooler, then this drama will suit you. Not my cup of tea though. Yssa Feb 26 2018 11:11 pm Love this drama so much! One of my all-time fave romcoms. Hana and Inguk had GREAT chemistry, they were just so natural with each other. I've become a fan of the writer and PD, too. Will watch anything from this team? Amberle Nov 05 2017 10:32 pm I thought this show was about high school, so didn't really want to watch it. But I was curious as it has Seo In Guk. Really glad I watched. It was a riot, can't remember when I laughed so much. It was such a light hearted funny drama. Don't overthink when you watch this, that's the trick. Just get sucked into the madness. Lee Ha Na is such a revelation. I'm watching this after Voice, and gosh she's so different. Now knowing that Voice was shot later than this drama, I'm totally amazed by her acting. She's so beautiful and icy in Voice. She's such an awkward, strange dork here that borders on ridiculous. Yet, she's also such an endearing fool here, a perfect contrast to Seo In Guk's character. She and SIG are totally at ease with each other in this drama. Yeah, some of the scenes were over the top and cringe worthy and some of it too ridiculous, but that's the attraction of this drama. It's total madness mostly, and yet, a lot of the scenes are heartwarming. It's about ties of relationships, of family, friends and colleagues. Watch it, but put away your judgements at the door. It'll make for a fun viewing. Amelia Jun 20 2017 5:05 am Oh boy ... Is it the requirement of Soo Young's character or is it Ha Na's acting? Very uncomfortable watching. Can't continue with this drama as it is too disturbing. Mutya Cruz Jun 16 2017 2:23 am My first time to watch a kdrama which stars Guk.and boy he moved me which his acting...he may not be the most handsome Korean actor but he will give them a run for their money with his acting skills. sara Feb 07 2017 12:05 am Lee Ha Na is 1 solid actress with a cute look.People who commended that the actress is not pretty,look again.If you wanna a Hot Kpop babe to be the lead,then not in this drama.Its Simplicity.She pulls any character off without much efforts,by just being herself..Check out VOICE with Jang hyuk.She is awesome! Chiaki N Oct 06 2016 5:58 am This was a nice suprise. I think i has of the best noona romances I've ever seen. Definitely a feel-good TV show to cheer yourself up with. lin Aug 25 2016 10:59 am While Seo In Guk's performance was absolutely beyond words, I wasn't able to finish this drama, had to stop at around episode 9. I just couldn't stand the female lead anymore. Did not ship them at all. Her character was weak, no particular personality, and her behaviors were just wrong. Pity. It would've probably been a great drama without her and the actress. ivan Jul 09 2016 5:21 pm is Lee Soo Hyuk second lead here? Becky Smith Jun 21 2016 9:15 am I loved this drama, "High School King of Savvy"! I already loved Seo In-guck. I had seen him in, "Reply 1997" and wanted to see other shows with him in it. I found his acting to be very easy going and genuine! He didn't seen to be acting, he felt so real in his character. I loved his juvenile spirit and easily believed that he was in high school. He had a fresh, affable personality that brought his character to life. Lee Ha-na was quirky and was a lovable, nerdy, young woman coming into her own womanhood. She seemed to be taking the long way around to find herself, but she was very endearing. Loved her acting and their chemistry. This drama just made me smile remembering the excitement of the newness and awkwardness of a first love relationship. I found myself laughing out loud at those embarrassing first experiences that we all have gone through. I look forward to seeing both in up coming performances. Even though some would say that the storylines in these type of dramas are predictable, I never tire of watching the unfolding of a new relationship between two people, especially when there is love. Keep them coming. Don't miss this one girls! hjie Apr 27 2016 8:04 pm I don't watch many Korean dramas but one day I was bored and picked this drama because of Lee Soo Hyuk without reading the synopsis. I expected a typical k-drama, something light-hearted and/or over the top... and that's exactly what I got. Good points of this drama (by k-dramas' standards): funny moments and characters + the directing/editing aren't as bad as your average kdrama + the acting was not that awkward imo + the age gap I guess, if you're into this sort of things + they didn't make the romance drag or unnecessarily dramatic and complicated. Bad points: I don't think the female lead character ruined the drama because she fit its crazy mood but she was indeed a bit random and boring (like all rom-com female leads) + I would have really appreciated if, for a change, they had given us another couple instead of a love triangle, there were enough lovely characters for this + the fact the lead was a highschool student didn't bother me because he doesn't look like a teenage boy at all (it felt more like he was a company director pretending to be a high school student) but ethically, it would have been better to have, idk, a freshman college student. Noia Apr 16 2016 3:28 am Seo In Guk's acting here is superb. He pulled off both character - a highschool student and the older brother. Full of cute funny scenes. And Lee Soo-Hyuk's presence here is a big time bonus! Jesuskid Mar 31 2016 5:03 pm Actually I was hoping that this drama would be lively and high school stuff but it was boring and the title doesn't even tally with the storyline,we don't know what happened to min suk hyung and it is very unrealistic for a woman who is ten years old ,a college graduate marrying a highschooler,it like a senior high marrying a junior grade student... very annoying and unrealistic...The female lead role ought to change too. Grant Mar 12 2016 3:48 am Don't get the hate on female actress here. Her acting is good and she's beautiful . I think this drama thought us to love ourselves/be yourself. you can't change who you are to please everyone. Look at Lee Min Seok, he likes Jung Soo Young just the way she is. Look at the scene when she's trying to be pretty as assistant but he asked her to wear her glasses back. He loves the way she is n thinks she's unic. Awkward ppl exist in real life tho. So stop the hate. Love everyone. Nobody's perfect. xo PS: love this drama. Better watch it! Winda Altra Mar 08 2016 11:51 pm @money I felt the same. Fell in love with Seo In Guk in this drama. He was that great to me. I mean I was really in love with him and searching everything about him and listening to "Finding Myself" everyday and never get bored. That was how this drama impacted me back then. A unique plot, handsome cute men, a weird woman, strong chemistry between the leading roles, sweet kissing scenes and a happy ending. How could I want more? Maureen Feb 08 2016 4:28 am I loved the drama n was expecting a unique change for the female lead role buh was disappointed. Klaudia Jan 30 2016 7:31 am This was really good comedy drama. I had a lot of laugh. One minus is woman lead. She was too weird. It's not about their ages...because it not a problem to me but this girl should be sweet and little crazy not weird. Nadiaknowsbest Jan 25 2016 11:09 am I really wanted to watch this drama because of Seo in guk. But then I found out that the female lead was a girl who was like ten years older than him and he was a high school student. It made everything awkward. I find the female lead annoying, in my opinion and if she was less annoying and not so old in the drama, I would have loved it. Louieboy4u Jan 12 2016 10:04 am This drama is weird AF. I mean how can you let your daughter marry a high school student who is 10 years younger than her. Even though they really love each other, it's still socially unacceptable (at least in my country). And beside, they're not rich to begin with. How can they survive a marriage life. So unrealistic. Amy tran Dec 28 2015 6:23 pm I love Seo in guk and lee soo hyuk so much omg! Tbh I love both male leads but I feel so sad for lee soo hyuk! The female lead actress is literally the part I hate about this drama. I mean y can't they choose another actress. Becuz of her the drama is ruin. But overall the drama is a MUST WATCH!!! Fighting oppa~ seo in Guk and lee so hyuk! Nive Dec 13 2015 4:40 am Gramps is sooooo cute !!!! leandra Oct 31 2015 5:34 pm To be honest, this drama was...crap. And I'm being nice. There's a few errors in this drama that I noticed. Like how soo young mentioned that the director was a year older than her. And then suddenly, they were both the same age. And hyung seuk is supposedly nine years older than min seuk, right? So that makes soo young eight years older than min seuk nd not ten. Little errors like this is ridiculous. I'm very pissed off at it. Little things count too. And also, I know it's fiction and all but it really was stupid and unrealistic. xynaux Oct 11 2015 10:32 pm Seo In-Guk and Lee Soo-Hyuk are the reason's why i keep watching this until episode 7. but.... i coundn't take it anymore.. the female lead is ruining everything here.. from her looks to her very baaaaaaad acting. her annoying face is just unbearable. i mean she is beautiful on her own way but when she act she gets ugly, very very ugly (im so sorry to say that). the story and casts are great except her. i think i'll be dropping it and move on to another drama. koz Sep 29 2015 5:45 pm @first lady did you watch him in I remember you/hello monster yet? enelra Sep 26 2015 7:03 am Nice acting Seo In-Guk!! !very natural and youre such a cutie while you act...highly recommended drama!! First Lady Sep 21 2015 3:31 pm I just started watching this drama and I'm loving it already. I met In-Guk oppa in Master's Sun and I thought he was cool. But believe me, he's way cooler in this drama. It's a must-watch! absentmindedG Sep 03 2015 5:40 am Omo..I cant believe that lee soo hyuk (director yoo) is 1 year younger than seo in guk (director lee)..Lee Soo Hyuk sure looks older though. Btw, i think that Lee Yeol-Eum looks a bit like Yoon Soo Hee..
Minsukkie Jul 17 2015 7:22 am This is the drama that made me fall in love with seo in guk. He is such an amazing actor! Very effective & believable. Too bad i couldnt say the same with the leading actress. Her actingbwas really awkward & weird.she only has one expression on her face when she's sad or happy or pissed. They should have casted a more experienced actress to match seo in guk's superb acting. But overall its a good drama. I was laughing the whole time. nymos Jul 16 2015 7:36 pm I love this drama So much!!!! Seo In Guk is So adorable. It's a modern movie and kind of different from other Korean movies I've seen(they were always sorta immature to me). Admittedly though, the ending is a bit unrealistic. Getting married... really? they should have found a better ending. Seo In Guk is a really good actor being able to act as min suk and hyung suk. Paulene Apr 09 2015 8:27 pm After Reply 1997, Master's Sun and the King's face, I decided to watch this drama as I was more curious about Seo In Guk, he displayed the right emotions and actions of a Highschool. His bff on this drama are daebak! All of them are good. Well, the love story is good, but I found myself not to pay more attention with their affections (kissing/ teasing scene) with each other. I get more excited when Direct Yoo and Soo Young meet or bump each other. It's not that it would be better it they paired together but I wanted to see more of Lee Soo-Hyuk. I am a fan of Seo In Guk. I can't believe Kang Ki-Young, is actually older than the main actor. Daebak! Joolie Apr 06 2015 6:52 am This drama was interesting at first, but then it got so weird. Where I come from, an adult dating a high schooler is illegal, not to mention incredibly sleazy. They cast the wrong woman as the lead. I mean, if they should have at least cast someone pretty. Ugh. I don't usually care about looks, but Lee Ha Na is incredibly bad looking. She constantly had this retarded look on her face, and would just stare at nothing, with her mouth open like a moron. Plus, her lips. Omg. They look like a duck, and I hate women with duck faces. She was not pretty, I found to her to be, for lack of a better word, ugly. Why she was cast alongside someone of Seo In Guk's caliber, I do not understand. It must have been horribly awkward for him to be kissing someone like her in the drama. I bet he washed his mouth out with mouthwash after every kissing scene. 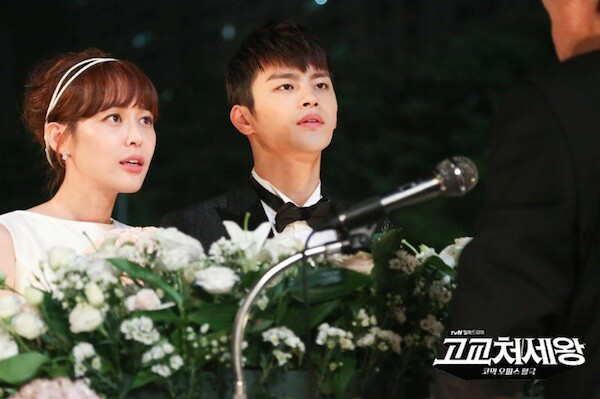 money Dec 21 2014 7:29 pm i second u @nabilah..haha..actually, this drama made me a fan of seo in guk. i never realized he was in master sun. i watched master sun b4 but sadly i totally ignored him there. bcoz of this drama, i began to search everything about him..lol..wow, such a versatile actor! this drama really show his acting ability. thumps up for him! can't question how good this drama..we can learn many things through this drama..i.e. relationship btween friends, family, co-workers, attitude towards elders, n many more..i really enjoying this drama. what more can i say? BoredAF Dec 21 2014 3:56 am I liked it for a while...but somewhere in the middle of the drama, I started to have little interest towards the drama. However, I did finish the drama and the ending was cute. nabilah Dec 18 2014 6:19 pm u know what.... im really happy how i dont see people hating on seo in guk's drama. (im saying this coz he is my first n only bias in k entertainment and because how i see people hating on the heirs eventho the ratings are so high makes me happy on the inside. haha. pretty faces doesnt mean good acting) ending is kinda questionable at some point but some parts are just too sweet to ignore. the way minseok care so much about soo young.... dem dem dem! adorable couple are the best!!!!!! shrill Dec 04 2014 6:14 am Very disappointed in the ending. To be honest, if Jung Soo Young had realized that her love for Min Suk was just an sisterly maternal love, and that Min Suk had found out that his feelings for Soo Young turned into merely love for an elder sister in the very end, the drama would have been more beautiful and realistic...sad, yes, and at least it's meaningful. I know it's just a romantic comedy and it should not be taken seriously; nor is it supposed to be realistic, but nothing about the ending left that huge impact on me; perhaps only shippers of the couple would really love the ending. Also, I want to see Min Suk leaving for college, and Soo Young and Director Yoo becoming close again, but without stating their relationship. Giving Director Yoo a random girl in the end just shatters the whole image, and the episodes focusing on the marriage of Soo Young and Min Suk also ruins the beauty of their relationship. I don't mind them having intense romance in the beginning, but it should've ended in a more...subtle way. Actually, the last episode should've ended in Min Suk's brother's revenge. Other than the disappointing ending, this is drama is one of the best dramas I have seen so far. It is witty, fun, and actually not cliche at all. It is so fresh, full of good actors/actresses, and the character development is excellent. It is predictable but unpredictable at the same time; once you get through the slightly lacking first episode, the other episodes would get you hooked on. yuanyuen Oct 20 2014 12:25 am shouldn't he leave for germany, return as a success man and propose her?? yuanyuen Oct 20 2014 12:21 am woww... great. but i think he should go to Germany and return as a success man and propose her. x Oct 12 2014 11:23 am Lee Hana is so adorable in this drama! I watched it for her but I don't like the male lead. Hafsii Sep 17 2014 9:37 pm @Melissa (haven't a clue how to reply but) I was wondering the exact same thing they're using LG G3 phones :) Other then the adorable granddad I'm not feeling any of the characters at all but unfortunately I don't like leaving things unfinished so heres to hoping it gets better! Soo cringey most of the time and eesh the evil director has the deepest voice...scary at times. Capricorn Angel Sep 12 2014 10:25 pm So natural, so honest, so pure. While other dramas are trying to make the dialogs and scenes as sophisticated as possible in order to make us feel amazed, this drama offers you to just get into this drama without thinking about why and for what this and that happened, and such things, but with the feeling of you're playing a game; full of imagination but still feels real. I also like that friendship of Min Suk, Tae Suk, and Deok Hwan. Omo they are so natural from head to toe! It's dragging me back to my high school times, my boy friends were like them too. And now I even know what they talked about when there's no girl around. They are sooo in bromance,always together in both happiness and sorrow. Mocking without someone getting angry. I'm really happy with those three! Team Leader Kim is also hillarious! Especially in moments when he and that one who always miscall Soo young by Joo young get a terrible problem. He panics out and that's so funny! Even Tae Suk and Deok Hwan impersonate him too hahaha. Thank You Very Kamsa for all casts and crews for presenting this awesome drama! I'm waiting for more dramas with this kind of scent. dadz Sep 11 2014 7:53 am . . . . THIs is super good . . .. . . . I'm not a fun of seo in guk but after watching this drama I'll reconsider the thought of not having him on my list . . . . this is the first time that i have seen a drama especially korean that made me satisfied when we talk about the ending . .. . . .. . BEST ENDING EVER . . . . . ..
lhynn Sep 02 2014 9:42 am Comedy but seo in juk and lee ha na I dont like their acting. catherine Aug 23 2014 12:35 am I haven't even watched this, yet I laughed so hard when I watched the trailer. Must be an amazing drama. Will watch it soooooonnnn!!! Jasmine Aug 20 2014 12:39 am Very entertaining... Like this yo! Melissa Aug 19 2014 4:53 am Hello!! I was wondering what phone (brand) do they use and what unit? Especially the one that has the blue case that sep in gum is using? Excalibunny Aug 18 2014 1:20 am The special is narrated by none other than Lee Hana! Her voice is so sweet and distinct! Can't wait for the sub..
siri Aug 17 2014 11:17 am I must say I began this drama with grave misgivings, especially with regard to the (often disturbingly) quirky and strange personality of Jung Soo Young... but as I watched it I was drawn in more and more by the pure heart and hilarity each episode brought to play.. and I began to appreciate the unconventional setting and characters for who they were rather than expecting them to fit an idea in my head. I really like that they didn't try to give the lead girl a 'makeover' and personality change, but rather made us gradually love her for the quirky person she is. Moreover they didn't shy away from an unconventional ending, didn't deal with diabolic second leads and refused the use of easy cliched tropes such as time jumps or time out abroad to smooth out the issue of an age gap. Most importantly the drama did what it set out to do with great success, tell a heartwarming and fun filled story about loyalty, love and camaraderie, and it made us laugh the whole way through to boot. The cast were all brilliant and enormous fun to watch, but none so much as Seo In Guk who carried the drama on his shoulder making us care so very much for his story and point of view. An outstanding and captivating performance, kudos to him and the whole team. Madeleine Aug 14 2014 3:31 pm I thought there was supposed to be a special. Brigitte Aug 13 2014 1:01 pm What's the new drama?? Neete Aug 12 2014 9:25 am Hallelujah, it has ended and finally a new drama next week. Can't wait. aline Aug 12 2014 1:00 am Great drama! The story is fresh and enjoyable to watch, nice ending too..
Excalibunny Aug 11 2014 1:12 am Lee Hana's portrayal of Soo Young is absolutely brilliant. Her lovely voice and awkward mannerism is just too adorable. How can anyone not like her? Such roles are really made for her. I still remember her first role in Alone In Love, with the same alien-like personality. I can't think of anyone else who can perfect such a role. I hope to see more of her in dramas. I missed her so much during her 5 years break! Snailz Aug 07 2014 9:09 pm Does anyone know what the music is called at the end of episode 16 or episode 17 trailer? maria Aug 06 2014 8:44 am what's the name of the actor who plays the captain of the ice hockey team?? Lovelyose Aug 06 2014 2:48 am What's the title of the song played in ep 14 when manager Yoo walking in the rain? holly Aug 05 2014 10:47 pm I can't wait for the last episode i mean if youve seen the preview soo young says " let's get married" LOL! Then looking at Min Suk's face after was priceless!!!! Mei Aug 05 2014 6:44 pm I feel dissapointed with the 16 episode. At epi 15 i thought that ah finally the story become more interesting but what a waste. How can comfo vs pavo end up just like that. I mean they should put this story more seriously rather than prolong min suk soo young love story. Can't believe lee hyung suk just end up like nothing happen at all after all of his effort. 실망있다 진짜. 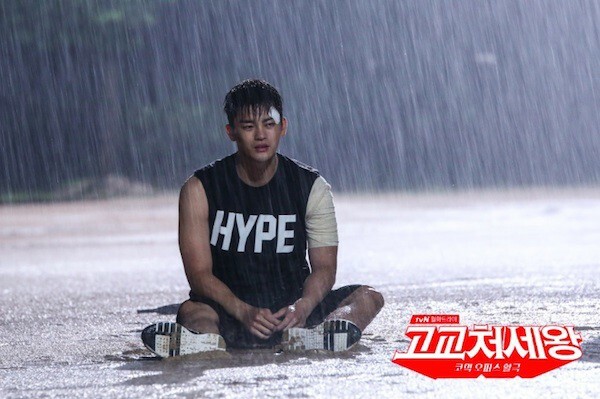 catblanche Aug 05 2014 11:09 am really awsome ep 15 ; how could the actor be two deferent character with two deferent age ; you can really believe that one is high schooler and the other one an adult ...seo in guk i really admire you ...your acting is really awsome. P.S: I like all aspect in this drama except the Soo Young girl (I hate the character not the actress). Even Betty (of Ugly Betty) is better than her. I hate her hair, her glasses, her cartoonish attitude, etc. So gross. Please don't put this type of character as female lead in the future. Thank you!!! P.P.S: I hope I don't sound so harsh. I have nothing against Lee Ha-Na. Mianhamnida. chairyn Aug 03 2014 5:41 am I really love this drama...its entertaining and inspiring...good job to those people behind this artistry. Its one of my greatest well-loved korean drama. Lee Min-Seok is indeed idealistic! I cant wait to see episode 15 to 17. Feline Aug 01 2014 4:26 pm SO in love with this drama <3 it's funny and touches your heart at the same time, there are no boring parts, and it's easy to watch, love watching In suk and Soo Hyuk, they're amazing <3 so good-looking and talented!!! Carmenita Aug 01 2014 8:29 am So disappointed with the combination. No sparks, no chemistry, nothing at all between Lee Min-Seok & Jung Soo-Young. sora Jul 31 2014 7:12 am The story actually really interesting, but the way jinwoo and minsuk "fight over a girl" scenario really look like a childish game, i mean, they can fight with a manly way (work competition or athletic competition). I understand if minsuk a little bit childish but jinwoo and soo young should be more mature than him. it feel likes high school romance with a mature setting. But i really appreciate all the actress and actor acting, really good and natural. i think i know how this going to be end, unexpected a new obstacle come after epi 14, but its a good start since the love story between minsuk-sooyoung-jinwoo is getting over climax. Imoan Jul 29 2014 1:30 pm Oops! I blundered on HIGH SCHOOL KING episodes. I should have said ep 13 should pick up where ep 12 ended rather than skipping a continuation of 12 and starting a new scene in 13. Didn't mean to cause any confusion without correction. Imoan Jul 29 2014 10:35 am What happened?! Shouldn't episode 12 have picked up where episode11 left off?! ep 12 melted down to only two actors upholding the whole scenario. I could sense distance between the two main male actors to the point that Lee Soo-Yuk gave the famous middle finger flip to Seo In-Guk in the elevator scene. Episode 12 was a total disaster. And why-oh-whyyy Lee Ha-Na was not allowed to grow-up by ep 6? A 28 year old acting worse than a 15 year old?Please, Please, Pleeeese! Stop using flesh and blood actors and actresses to imitate or mimic comic book characters. Using a manga or comic book story line is Ok but, to try transforming a real person into becoming the very image of a comic book or animated character is totally ridiculous, aggravating and not funny - In No Kind of Way! I love all the actors chosen to be in "King of High School" but the director was asking too much of them. I am sure Lee Ha-Na was very worn out by the time ep12 was completed. I kept hoping her character would have finally grown into maturity by then so that she and Jin Woo can love each other. yumi Jul 27 2014 1:48 pm Does anyone know the name of the ending song of ep 9 and 11? anthy Jul 25 2014 11:46 am Ommo!! Love this drama,,episode 13 has been released..? Ashila Jul 25 2014 5:57 am I really hope that Soo-Young won't end up with Min-Seok. It's just so sad to see that Yoo-A hurts. How can a sister be so cruel for just a love which happens for a short time? Melanie Jul 24 2014 10:32 am ommo!now Iam so addicted to this! cant wait for episode 13 now that popcorn sister already made up her mind!f ighting! Melanie Jul 24 2014 10:26 am OMMOOOO! it started as 'good as nothing" but now I'm hooked to this drama! and i take back what I said! It is never 'good as nothing'! It's the best thing I've ever seen! waiting impatiently(just kidding^^) for episode 13! I wonder what will happen next now that popcorn sister have already made up her mind!...FIGHTING!!! Brigitte Jul 22 2014 6:32 pm Omg!! This dramas is so good and not boring at all!! I can't wait for episode 12!! I totally want Ming seok and the popcorn sister together they are cute the sister Yoo-Ah is so annoying though she wasn't even dating Ming seok! I hope the drama ends well and everyone happy but I really want them together Heavy black heart️Heavy black heart️ Anyways does anyone know how many episodes they'll be?? wildfly Jul 22 2014 2:20 pm extension confirmed. Seyoung Jul 20 2014 3:06 am Someone please take popcorn sister and dress her up. So, she can be prettier.. Can't wait for episode 11.. huaa! Deb Jul 19 2014 4:21 pm Looove this drama. There are some really great romcoms out right now (Marraige not Dating and Fated to Love You) but this has my heart. Shakira REALLY good point about the lack of the makeover scene. Min Sook really likes Popcorn sister JUST AS SHE IS! It was so funny how his friend was trying to be nice and described her as being like an "alien" and not like other girls. Then right after Min Sook exclaims that yes, it's a reason she likes her so much! I loved that! a Apart from Jin-Woo's dad I love all the secondary and side characters. I'm fully invested in the High School King universe. Shakira Jul 18 2014 6:04 pm OH MY!!! I CAN'T WAIT FOR EPISODE 11!!! I like that popcorn sister is not a conventional beauty and I'm glad at this point they haven't done the typical makeover scene. Like "whoa I didn't know you were cute til you changed your clothes and hair, now I like you". Even though I love those dramas too. This is refreshing. Her character is really sweet and caring and that's what makes her attractive. anooony Jul 18 2014 1:34 am has anyone notice.. lee hyun - seuk at episode 10 lee min seuk's older brother during the time they fight at the event with ji won?? Madeleine Jul 16 2014 4:23 pm Episode 9 is the most romantic episode I have seen in a k drama. It was perfection - love, adorable romance. Ms Milk Toast still weirds me out a little with her deluxe dorkynessi but I have to admit seeing her sleep with her glasses on was funny. dramADDICT Jul 16 2014 3:10 pm Such a wonderful and funny drama that more people need to see! I like the non-stop pace and all the developing second stories. Seo In Guk is sheer perfection in the dual roles as the high schooler pretending to be his executive brother. I thought this would not be believable. I am glad I was wrong. 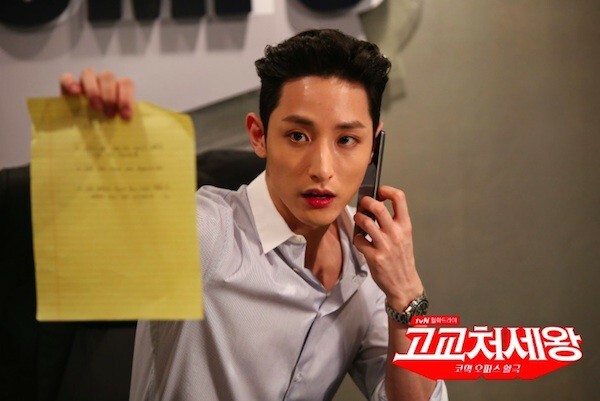 The chiseled body of perfection, Lee Soo Hyuk, has shed his pretty boy model only image to play the role of the troubled son of the chairman. I feel the pain he portrays trying to win the approval of his father and protect his institutionalized mother. Spoiler: The bomb drops in episode 10!!! It will be hard waiting for episode 11.
annidaunnatiqulya Jul 15 2014 9:23 pm you have to watch ep 10, great! Aisha Jul 15 2014 9:26 am This is an amazing drama. I am in love. It has an intense love triangle even though director yoo doesn't know he loves her yet *wink wink* but episode 10 looks amazing. I wish the subs come out faster because I can't wait much longer. I definitely recommend this drama to anyone. It's seriously awesome!! Madeleine Jul 14 2014 9:56 pm Episode 8 is one of the most romantic episodes I have ever seen in a kdrama. I find her character overly meek and mousy so that sort of distracts me but other than that I have enjoyed this drama a lot. I do not understand the 2nd lead's treatment of her, although I can understand his personal pain, just do not understand how he could use her that way, so I am looking forward to more and also want to know what happened to his brother and hope he is okay. I also really like his adopted father very much and seems he knows the President, maybe 2nd lead's mother was his wife who ran off with the President? aonaaa Jul 14 2014 4:50 pm This might be one of the best drama's I've ever watched. I just finished episode eight, and I still have high hopes for the coming episodes. Seo In-Guk is not only eye candy to look at, his acting skills left me in awe as well. Moreover, I really like how the drama is aiming for a refreshing approach, in that it doesn't follow your typical everyday mellow romcom formula. I do believe it has a rather realistic storytelling. The shaky camera and the alternative soundtrack both contribute to this new feeling. Some might feel that it has a slow pacing, which I agree to. However, I think this is genuinely necessary to help build up character's backstory and in order for us to relate to them. It's also very relaxing, because you have the feeling that anything can happen, at least for me. I didn't end up frustrated because of how I wanted things, rather, I could sit back and relax to see how the story would unfold. And besides, I only felt that the first few episodes were "slowly paced", you really get to enjoy it thoroughly afterwards, you have my digital word! The characters in general are all interesting, and have a more in depth element to them rather than being flat as opposed to many other kdrama's. The comedy is well balanced, it's not straight up slapstick, but it does make you chuckle from time to time.. I feel like this drama could be described as mature and alternative, if you will. Hence my curiosity as as to how this drama will unfold! In conclusion, it's not boring/slow, it's different, which is why I believe it's so original and definitely deserves more recognition. P.S If all that didn't convince you, watch it for Seo In Guk, do it for the Guk! sora Jul 14 2014 8:21 am to Quynh: It is sang by Honey G - 셀렘. Honey G came from Super Star K4. they're vocal color remain me of 4men. Yana Jul 13 2014 9:37 pm This drama was very boring at episode 1. I dropped this drama halfway of episode 2. I don't know why, but I guess it didn't really have that tug to keep on watching. And the lighting of this drama is too gloomy and moody to be a rom-com. So I've been reading some small recaps and seeing photos of it. And I decided to start the drama again at episode 8. It became more watchable. I guess, if you pay attention to the drama closely you might like the drama. And it's SLOW PACE. I don't like any characters, but oh well, maybe they'll get more interesting later on. Madeleine Jul 13 2014 8:40 pm I am enjoying this drama a lot. I love the sports scenes and office situations so far. Obsessed stalker bully girl pretty scary; I just watched 3 episodes and feels like she could burn a house down. Lee Ha Na's character as her sister is bizarre since she is her convoluted opposite, yet both of them are pretty obsessive they share that much. Hate her head hanging, dopey frumpy girl outfits and her sulking schloompy walk. I guess she is following the director's and writers on that score. Most of the females in this show are quite bizarre and sort of extra estrogen challenged. Davia Jul 13 2014 3:51 pm I don't like to criticize people publicly but acting a person who has low self esteem entails a lot more than holding ones head down and making weird facial expressions. Thankfully the character's esteem is improving and we are not being subjected to this anymore. Subtlety in acting is really important. Otherwise the acting in this drama is excellent by everyone including the supporting cast. carlito Jul 12 2014 8:54 pm i really like this series, the cast are too fit for their respective roles. This drama has become one of my favorite korean dramas. i am on episode 8 and looking forward for the future episodes. God bless the characters and behind the scene people. le Jul 11 2014 3:04 pm i saw the 1st episode and just loved this drama. lee ha na and seo in guk are really good actors, they are pretty hilarious too. comedy suits them well. tvn really has so many good dramas. i wished the major networks did a better job of choosing dramas, writers and cast. i think kbs is the worst, then mbc, but sbs has good dramas usually. funny i noticed King Of High School and Trot Lovers lead couples switched partners from Reply 1997 and Meri Daegu Attack Defense Battle, and are rivals in same time slot. i've been a fan of lee ha na since alone in love, when spring comes, meri daegu, and women in the sun, hope she acts in more dramas. druegnor Jul 10 2014 9:55 am Lee Ha Na Noona..
Love to see you acting again. Kinda sad there is not many drama you are in..and it seem you are trying very hard in pulling that character..Noona fighting!!! Having surpasses 1% rating is a success for this cable-TV drama and Seo In Guk acting is improving from previous drama ive see him in (Love Rain, Reply 1997). This drama can be another hit for tVN after Reply series and Emergency Couple. briseis Jul 08 2014 4:15 am The ratings are actually pretty good considering it's a cable TV drama. Pay-TV channels have less viewers than free-TV channels like SBS , MBC or KBS2. The general consensus is that if the show gets past 1% it's a success. With HSK being near the 2% mark means the drama is going strong in the ratings. SanGK Jul 06 2014 11:13 am Min-Seok and Soo-Young shouldnt' be a couple. I think MS just need to care of Soo-Young and in love with Yoo-A. That's a touch when Yoo-a knows her "boyfriend" likes her sis. Melissa Jul 06 2014 1:07 am I am really loving this show, and the actors that portray the characters! I don’t understand why the ratings are so low, because this show is really good. I especially like Lee Ha Na’s role as Soo Young, and the way she is brings a different light to the show. She gives the show it’s comedy, life, and inspiration to others. Her personality according to others may be different, but that is what I like about her character. I don’t think the writer should change anything about her, because that is what makes the show interesting to watch. I am really loving Lee Min Suk’s character, because he does not act like the rest of his peers or coworkers. He is a very kind, gentle, and caring guy. When he is at school he does not act or think like an actual high school student, and when he is at work he begins to realize and go against the cruelty of the work world. I think he and Soo Young are the perfect match because they are in many ways similar, as well as his feelings for her are sincere. Quynh Jul 05 2014 9:14 pm Can someone please tell me what is the name of the song at the end at the drama. The song that was playing when they were hugging and the recap part. sora Jun 28 2014 4:37 am Very interesting n funny drama esp lee hana character, i feel so sorry for her but yet jelous if only i have 2 handsome boss >___< the lead female n male chemistery is so natural, simply lovely. arkar Jun 25 2014 10:33 am love this drama and love all the charter so far . Ave Jun 25 2014 3:02 am can you please fix your camera it's really hard to watch it is always moving. neko Jun 21 2014 4:42 pm This drama make me feel embarrassed for the characters and it's funny. Vii Jun 20 2014 3:38 am OMG SEO IN GUK<3 can't wait. oppa, hwaiting~! Marinah Jun 19 2014 5:25 pm Even though I can only read the subtitles because I only understand English, the show is amazing. The story line is just great! regine Jun 18 2014 6:20 am What's the title of the song in episode 2 while they were in the bus, tired from work? sora Jun 17 2014 8:44 pm FIrst episode is very interesting, i love both lead female and male character, unfamiliar face but their act is superb, esp lee ha na, clumsy yet adorable character. double role for seo in guk, i really got to see this. can't wait to see next episode. Excalibunny Jun 13 2014 8:10 am Woooooo Lee Ha-Na!! I loved her in Alone in Love and Le Grand Chef. I'm going to watch this! MA Jun 09 2014 12:13 pm I cant wait to see lee soo hyuk AGAIN!